KIEV, Ukraine -- Things just got shadier in the city of shady land deals. The Kiev prosecutor’s office on March 31 launched a criminal investigation after the disappearance of records involving the privatization of property in the capital. 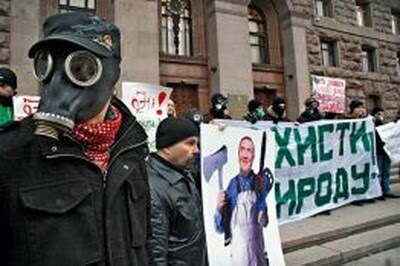 Demonstrators outside the Kyiv City Administration on March 13 protest Mayor Leonid Chernovetsky’s sales of city land. Critics charge the mayor with cheating taxpayers out of more than $1 billion through shady transactions. The documents could shed light on what critics call “land scams” – the sale of valuable municipal property to insiders at cut-rate prices. Opponents charge that the administration of Kiev Mayor Leonid Chernovetsky has cheated taxpayers out of almost $2 billion in the last four years through non-transparent and non-competitive transactions. Chernovetsky, deeply unpopular in recent polls, has defended the land-sale practices as above-board and in the city’s best interests. The latest wrinkle – and it’s a strange one – happened after a city council member reported his car stolen to Kiev’s Shevchenksky district police. The council deputy told police the privatization records were in the car, according to the prosecutor’s office. The alleged theft of privatization records come after an audit of city records was ordered on March 15 by Deputy Prime Minister Volodymyr Sivkovich, the former Party of Regions deputy now in charge of the nation’s law enforcement agencies. Kiev city prosecutors opened a criminal investigation amid skepticism as to whether the theft occurred and, if it did, what it might mean, since presumably back-up records exist electronically somewhere. Opposition deputies on Kiev’s city council said the records’ theft is contrived to cover up evidence of shady privatizations orchestrated during the tenure of Chernovetsky, the businessman turned mayor. Valeriy Karpuntsov, a city council deputy from the oppositional bloc of Vitaly Klitschko, said the car theft and alleged disappearance of privatization documents are an attempt to cover up the criminal acts city officials have committed over the past four years. Hundreds of hectares of Kiev’s land, forests and parks have been transferred from public ownership over the past several years with much of the capital’s non-residential premises put up for privatization, according to the Interior Ministry, which in January said it had uncovered 105 land grab deals in Kiev Oblast alone last year. In an open letter sent on March 19 to Yanukovych and Prime Minister Mykola Azarov, boxer Klitschko, leader of an eponymous faction on the city council, asked them to dismiss Chernovetsky as Kiev mayor and call a fresh mayoral election and elections to Kiev City Council. “The situation in the Ukrainian capital is catastrophic. Rumors of economic chaos, large-scale corruption and blatant unlawful actions by the city’s leaders have circulated for a long time,” Klitschko wrote in the letter. First elected to a four-year term as Kiev mayor in 2006, Chernovetsky also presides over the executive council of the Kiev City Council. That body works hand-in-hand with Kiev City Administration to manage the city’s real estate holdings and oversee commercial activities, including foreign investments and large real-estate development projects. A successful businessman who founded Pravex Bank, one of the largest in Ukraine, Chernovetsky was reelected Kiev mayor in a May 2008 snap election. His current term ends in May 2012, unless parliament sets an earlier date. On March 13 he met with President Viktor Yanukovych, and a week later sacked 10 deputy heads of the Kiev City Administration, days before records of Kiev’s privatized property disappeared. According to Kiev’s Main Auditing Department, known as the Kontrolnoe Revizionnoe Upravlenie, deputies from Kiev’s City Council over the last four years have authorized the privatization of 2 million square meters of communal property at the official rate of around Hr 500 ($40) per square meter, bringing in about $138 million. Dmytro Andrievsky, a Kiev city council deputy from Klitschko’s bloc, said a square meter of real estate in the capital is actually worth about $1,000, bringing the total value of privatized property close to $2 billion. “We floored motions on six occasions during city council meetings to create a special commission to monitor communal property sales, but the question was removed from the agenda each time,” he said. Andrievsky said he expects the privatization of more city property to be on the agenda when the next scheduled Kiev City Council meeting is held during the middle of April. Myroslava Mushka, spokeswoman for the Kiev Prosecutor’s Office, on April 1 denied media reports that the stolen car containing the records belonged to Volodymyr Deneyga, the Party of Regions city council deputy who chairs the Kiev City Council’s communal property committee. Mushka, however, would not confirm or deny that the stolen vehicle belonged to Deneyga’s first deputy on the committee, Petr Ivanov, a member of Mayor Leonid Chernovetsky’s bloc. The Kyiv Post attempted to contact Ivanov without success. The Kiev City Administration declined comment, directing inquiries to the press secretary of Oles Dovhiy, chairman of the Kiev City Council, who said she would pass on the question to the press service of Leonid Chernovetskiy’s bloc. The Internet news site ProUA, meanwhile, found Ivanov, who on April 1 confirmed the documents and his Volkswagon jeep were stolen from a parking lot on Prospekt Peremohy on March 26 between 2.30 p.m. and 4 p.m.
“Only a limited number of people knew I had taken the records. I brought them all to the State Office of Communal Property and was supposed to bring them to the privatization commission from there. Officials who work in these offices have the right to examine them and draw conclusions,” ProUA quoted Ivanov as saying.